NOTICE: Activation key must be used on a valid Steam account, requires internet connection. 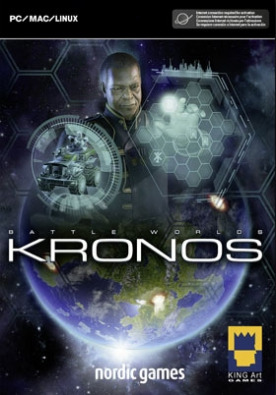 ABOUT THE GAME	Battle Worlds: Kronos is a classic turn-based strategy game in the tradition of Battle Isle, Advance Wars and Panzer General. Have you ever wondered what games like that would look like today? Well, we did. As a result, we decided to develope Battle Worlds: Kronos.KEY FEATURES Two Single … Player Campaigns (~50 hours of gameplay) Single Player Challenge Maps - Test your skills in different combat scenarios and keep track of your progress. Live Multiplayer - Battle your friends live on the internet (cross-platform) or via hot-seat. Asynchronous Multiplayer - Take all the time you need and consider your moves. Similar to play-by-mail, your round is stored on our server and turned over to your opponent. The system allows you to continue the match anytime and anywhere you want (cross-platform). Online Features - Leagues, chat and - in early 2014 - tournaments. Strong AI - A clever AI that will challenge even experienced commanders. Map Editor - A powerful editor to create your own maps and missions (Windows only). Includes Trains DLC - Additional ~15 hours campaign, new units and new multiplayer mapsSYSTEM REQUIREMENTS Windows Minimum: OS: Windows Vista, 7 or 8 Processor: 2.0 Ghz Dual-Core Memory: 2 GB de mémoire Graphics: DirectX 9c compatible with 256 MB RAM, Pixelshader 2.0 DirectX : Version 9.0c Hard Drive: 3 GB d'espace disque disponible Sound: Integrated audio interface	Mac Minimum: OS: Mac OS 10.6 (Snow Leopard) or newer Processor: 2.0 Ghz Dual-Core Memory: 2 GB de mémoire Graphics: OpenGL 2.1, Intel HD Graphics 4000 or better Hard Drive: 3 GB d'espace disque disponible Sound: Integrated audio interface	Linux Minimum: OS: Ubuntu 12.04 LTS or newer Processor: 2.0 Ghz Dual-Core Memory: 2 GB de mémoire Graphics: OpenGL 2.1, GeForce GTX 260 or better, proprietary driver recommended Hard Drive: 3 GB d'espace disque disponible Sound: Integrated audio interface Notes: Might work on other Linux distributions as well (see Forum) Battle Worlds: Kronos © 2013 KING Art GmbH. All rights reserved.We assume no liability for damage caused by possible viruses. All brand names and trademarks are property of their respective owners.